When Tiago Morgado idealized Algorrithmic Chaos for his DNP X-Citer alter ego he thought of a way to break, in a certain way, with the IDM tradition, following some of the guidelines defined by Scanner the german musician (in the sense of not confining IDM to reductionist formulas). 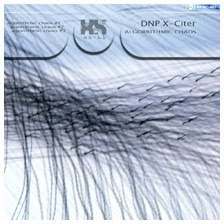 The background for this DNP X-Citer ep is Tiago's influences and reverence to artists such as Aphex Twin, Autechre (warp records), Alva Noto, Ryochi Ikeda and Byetone (raster noton) but also Nine Inch Nails and his approach to industrial rock that Einsturzende Neubauten, Throbbing Gristle and etc... brought to music. All this influences can be identified in the electronic part of the DNP X-Citer ep which serves as the basis for an improvised "free/structured" with alto viola. Again in this improvisation several references can be found, such as, Ornette Coleman, Sun Ra, Pharaoh Sunders, Frank Zappa, John Zorn, Otomo Yoshihide, Fred Frith, Evan Parker, among others. The electronic part of the ep was worked with the use of algorithmic composition techniques, where instruments in the DAW (digital audio workstation/sequenciador) were triggered by MIDI, according to simple theoretical and systematized assumptions from the AC Toolbox (designed by Paul Berg from the Sound Institute of Haia). tiago morgado as been working with these tool because he believes that it can be helpful in his work with algorithmic composition. Algorrithmic Chaos is a technical work, without an a priori conceptual background, but when Tiago Morgado analyzed it a posteriori an organized chaos appeared. And based on that, using contemplation maybe you the listener can identify a theme for this ep.